An article written by a group based in Athens, TPTG, in July 2006 about the struggle of students against neoliberal university reforms. Effective accommodation of labour market needs and, thus, flexibility of provided studies. The publication of the planned reform was the sparkle that ignited students' mobilizations which started in the end of May and spread quickly all over the country. 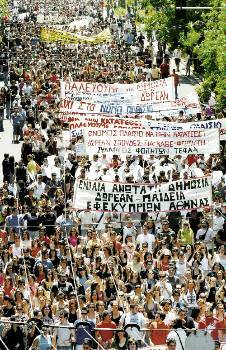 In the beginning of June, at the culmination of the movement, more than 2/3s of university departments were occupied and continuous mass protests and demos disrupted the city centres of Athens and Thessaloniki (an unexpected development since no student mobilizations have taken place in the last 20 years at this time of the year, just before summer exams and holidays). The government was obliged to 'freeze' the reform, postponing it, possibly for next autumn. Due to the freeze and the summer break, mobilizations have stopped with a promise of reappearing next autumn. Occupations were practically supported by the most active students (leftists and autonomous elements), but the participation in assemblies and demontrationss was high. The struggle was also supported by the union of university teachers, or, better say, those teachers who do not or can't participate in the entrepreneurial university activities. Students' high participation is attributed to accumulated discontent with the continuous intensification of the studies and the widespread experience of precarious and devalued labour. A more thorough research about the class composition of the movement, the everyday experience of the subjects of the struggle, their goals and ideas remains to be made. What we can say for sure is that slogans and activities in the demos and the leaflets that were distributed expressed a lack of imagination and that they mostly reflected the ideas of the state capitalist political organizations active in the universities. The latter ones insist on the maintenance of the 'public and free [that is, state controlled] character of university education' and the demand for 'full and secure employment'. On the other hand, the rank-and-file expressed an inarticulate denial of the worsening conditions in the university and the workplaces and an outright desire to stop work time. Very few attempts were made to address wage workers. In one of them the Thessaloniki Medicine School students organised a meeting with doctors and nurses working in the nearby hospitals (many of them are precarious workers). In another case, some radical elements (both students and non-students) organised an expropriation of books from a big book store in Athens during a big demo, protesting against the abolition of free textbooks. They also distributed leaflets to the personnel, explaining the meaning of this expropriation. And, of course, during the demos there were the usual anarchist attacks on banks and cops.